With every fibre of his depraved, sinister being, Satan despises the Jews. He hates them with a perfect hatred. Their total destruction was and still is his goal. He’s the author and spirit of Anti-Semitism. There is no other way to explain the venomous hostility that has been hurled against the Jews by so many people, in so many countries, for so many years. This is a question that has been asked countless times and many answers have been given. It has been said that Christianity is the chief cause of Anti-Semitism, since the church has accused the Jews of deicide (killing God). But this theory does not explain the presence of Anti-Semitism in Non-Christian countries such as Iran, Syria etc, nor does it account for the fact that Anti-Semitism existed before Christianity began. Jerusalem and the Jewish people were on the devil’s hit-list long before Yeshua (Jesus) was born (Ezra 4:12 – 16 and the Book of Esther). 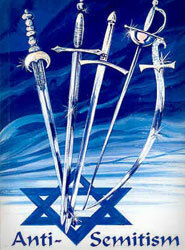 Some have argued that the reason that the Jews have been so universally persecuted is because of the uniqueness of Judaism and to be a chosen people. On the other side of the coin, Islam claims to have replaced Judaism and Christianity because of their failure to obey the laws and the calling of God. Muslims believe in one god (Allah) with high standards and laws and they have traditions that make them separate. Yet, Muslims have not been universally persecuted. Islam thrived on hatred of Israel. Arab nations eagerly await jihad (holy war). There must be a scrap-goat for the ongoing Middle East crisis and Israel will most certainly be blamed. The devil is convincing the world that Israel is the problem and that it is time to get rid of the Jews. Hatred against the Jews has been too intense, too universal, and too destructive to be explained in divine punishment. Anti-Semitism has clearly overstepped the bounds of heavenly judgment and chastisement. The origins of Jew hatred are supernatural --- but not from above. In reality, there is only one way to explain Anti-Semitism; the devil hates the Jews and his demented nature is revealed in his treatment of the Jewish people. While many other nations and groups have felt the fury of his wrath, none have felt it so often, so consistently, and so powerfully as have the “seed of Abraham.” If the devil himself, the father of all lies, is not ultimately responsible of Anti-Semitism, then why have so many people believed such ludicrous anti Jewish lies, lies that in any other context would be laughable? It is not only the ignorant and unlearnt who have been fooled, but it is political and social leaders, spiritual and intellectual giants, who have also been deceived. Why does Satan so passionately despise the Jews? For one thing it is a reflection of his hatred for God. The Jews are God’s chosen people! By hurting them he seeks to hurt the Lord. His effort to annihilate the Jews is also an attempt to discredit the Lord because He had sworn in His Word that they will never be destroyed. To understand the Anti-Semitism of this century, one must look back two thousand years to the birth of Christianity and its separation from its beginnings in Judaism. As we look back to the beginning of the Christian era, the issues are indeed many and complex. Only through knowledge of that critical time of transition can we understand the roots of the prejudice which had developed into Christian Anti-Semitism. And, to understand how a thoroughly Jewish religion of the Nazarene sect became the anti-Jewish religion of the Christian Church, it is necessary to re-trace the events of the early centuries starting with Yeshua (Jesus). His childhood was typical of young Jewish boys of his time. He was circumcised on the eighth day after his birth, received a religious education, learned a trade, kept the Law of Moses, and spoke both Hebrew and Aramaic, the languages of the Jews of his day. Upon reaching the age of 30, he began to preach and teach about the Kingdom of God, calling people to repentance, and ministering to the sick. Many people began to follow him. After the death of Yeshua, His inner circle of Disciples became the leaders of the first century church and they were also Jews. For a number of years the early believers in Yeshua (Jesus) as the Messiah were culturally and ethnically similar to, and even at times worshipping alongside their mainstream counterparts. However, a number of religious and political events in the latter half of the first century and the early part of the second began to drive a wedge between Church and Synagogue. A record of one of the earliest conflicts is recorded in a book of the New Testament ~~~ The Acts of the Apostles, chapter 15. How striking is this passage! While they (Romans) are actually nailing Him to the cross, He seems to feel the injury they did to their own souls more than the wounds they gave Him; and as it were to forget His own anguish out of a concern for their own salvation. And how eminently was His prayer heard! It brought forgiveness for all that repented and a suspension of vengeance even for the un-repented. The ethnic composition of the first century church began to rapidly change from a Jewish majority to a Gentile majority. The destruction of the Second Temple in AD 70 contributed both to the growth of the early church and rabbinic Judaism. Demoralized after such a loss of Jewish national and religious life, the Jewish people were now grasping for something to believe in. Hope in a Messiah to save the people from the oppression of Rome began to grow. At the destruction of Jerusalem 1,100,000 Jews were killed and 97,000 taken into slavery and captivity. In AD 132 Simon Bar Kochba ("Son of the Star') was endorsed by the Jewish Leaders to be the promised (false) Messiah. Bar Kochba led a revolt against Rome in AD 135. The revolt against Rome under Emperor Hadrian caused the death of 500,000 Jews; thousands were sold into slavery or taken into captivity. However, the Jews who had believed in Yeshua (Jesus) as the Messiah (early church) did not join the revolt. Bar Kochba killed a number of them, seeing them as enemies, heretics and traitors to the national cause. Outraged at this, the growing Mediterranean church began to harbour bitterness against the Jewish people. The surviving Jewish believers in Yeshua, who felt both a loyalty to Israel as well as to the western church, were being alienated by both groups. By the second century C.E., both Judaism and Christianity were trying to distinguish each from the other in the eyes of Rome, as both had unique political concerns. Judaism by then had attained legal status in the Roman world as a religion and did not want Christianity, with its loyalty to a King other than Caesar, to be associated with it. The church, now largely Gentile, also wanted to obtain legal status in the eyes of Rome so that it would not be identified with the Jews, who had rebelled against Rome under Bar Kochba. Once it was clear to Rome that Christianity was not a sect of Judaism, Christianity was regarded as an illegal sect and was no longer under the protective umbrella of the legal status of Judaism. It is interesting to note that from the birth of the early church until the time Emperor Constantine had declared that Christianity to be the official religion, both Jew and the new church were persecuted. With the establishment of Christianity as the official religion of the Roman Empire by Constantine in the fourth century, Christianity soon began to enjoy a position of superiority over Judaism which caused serious consequences for Judaism. Under Constantine, the church became “a state church” and the persecution of “Christians” ceased, while the persecution of the Jews continued. The Council of Nicea AD 325 called by the Emperor Constantine to settle some theological differences that were dividing his Christian Empire. The first act of the three hundred bishops assembled was to set a date for ‘Easter’ to be distinct from the Jewish Passover thereby effectively separating Jews and Christians. To mainstream Jews, this change appeared as a willingness on the part of the early church to be a lawless society. They also feared this would allow pagan influences into the Jewish-Christian circles and eventually, Israel. The first, in the first century, was a pre-occupation with determining who Christian was and who was not. The second stage was longer, more tortuous, painful and destructive to Jewish sensibilities. It was marked by a move from concern with purely Christian self-definition to formulating the Church as a distinct entity from Judaism. By the year AD 347 - under the teachings of John Chrysostom, a cruel, vicious spirit of Anti-Semitism arose. And under his Leadership, the church, who was now ‘Israel’ had to discredit the physical Israel and turned out volumes of literature to prove that they were the ‘true’ people of God and that Judaism had only been a prelude to, or in preparation for Christianity. Chrysostom’ teachings were prompted by the fact that many Christians were still meeting on friendly terms with Jews, visiting Jewish homes, and attending their synagogues. He said: "The Jews sacrifice their children to Satan....they are worse than wild beasts. The synagogue is a brothel, a den of scoundrels, the temple of demons devoted to idolatrous cults, a criminal assembly of Jews, a place of meeting for the assassins of Christ." On another occasion Chrysostom is quoted as saying "I hate the Jews because they violate the Law. I hate the synagogue because it has the Law and the prophets. It is the duty of all Christians to hate the Jews." Chrysostom' teachings were to be used in seminaries and schools for centuries as model sermons, with the result that his message of hate would be passed down to succeeding generations of theologians. Augustine, the great theologian, was also guilty of the growing hatred. In a sermon on Catechumens, he says: "The Jews hold Him, the Jews insult Him, the Jews bind Him, crown Him with thorns, dishonour Him with spitting, scourged Him, overwhelm with reviling, hang Him upon the tree, pierce Him with a spear...The Jews killed Him." The early Church Fathers had sown the seeds of intolerance and Jews were to become the object of hatred and persecution all over Europe for centuries to come. This 1,000 year period is known as the “dark ages” when the Church, an institution now totally run by man, degenerated into full apostasy. The further they fell into apostasy the crueller and destructive they became in their persecution. As this took place the persecution of Christians and Jews increased into unbelievable acts of torture and death. As early as 1516, Martin Luther wrote, "… Many people are proud with marvellous stupidity when they call the Jews dogs, evildoers, or whatever they like, while they too, and equally, do not realize who or what they are in the sight of God". In 1523, Luther advised kindness toward the Jews in That Jesus Christ was born a Jew, but only with the aim of converting them to Christianity. When his efforts at conversion failed, he grew increasingly bitter toward them. The list of Jewish persecution and Anti-Semitism is so vast that we only mention but a few. To understand the past is to be able to understand the future. And, because the conflict is spiritual, one does not need to understand all the implications of political and social issues. For God is sovereign over all things; the goal is to pray for a spirit of repentance to fall upon all nations, and for the Lord’s will to be done. 1Thesellonians 2:15 -16; Paul wrote two very controversial verses directed towards some Jews of his day. Paul says that some first-century Jews were responsible for instigating the death of Yeshua (Jesus). Furthermore, the nation of Israel has a long history of rejecting the prophets that God sent to them. Finally, it was the Jewish religious leaders in Thessalonica who instigated the riot that led to Paul, Silas, and Timothy being run out of town. It was also the Jewish religious leaders who resisted Paul’s efforts to share God’s good news about Yeshua with the non-Jewish people. So in these verses Paul is not talking about all Jewish people of all time, or even all Jewish people of his time. This passage is a condemnation of some of the Jewish people of a particular time in a particular place, specifically the religious leaders who rejected Yeshua and opposed the early church in the first century. What Paul is saying here is that those Jewish people who were engaged in the activities he lists here are under God’s judgment. He’s not talking about all Jewish people everywhere, because Paul himself is Jewish, and the Christians living in Judea who were suffering were also Jewish. Tragically, horrible evils have been justified toward Jews from a misinterpretation of this passage. This is not God’s heart, for God loves the Jewish people—they are His chosen people. Paul makes it clear that the Jews who are hostile to Yeshua (Jesus) are heaping judgment on themselves and their hostility will one day be answered by God. It is important to understand that God’s wrath isn’t referring to God losing His temper and flying off the handle in anger. Paul is talking about God’s justice to those who oppose His work in the world. As we see in Psalm 2 it will be an awful thing to be found with Anti-Semitism in one's heart when our Jewish Messiah returns. Why, because our Messiah Yeshua is the coming Prince of peace. Today the mounting persecution of the Jews eerily parallels ~~~ with the persecution of Christians! In Texas, USA during February 2010 – NINE churches were torched by arsonists and burnt to the ground. Who would ever have imagined this? Islamic groups such as Fattah, Hamas, Hezbollah, Al-Qa’ida and Islamic Jihad groups are perpetrating murderous attacks against Jewish and Christian interests worldwide, targeting schools, churches, synagogues, restaurants, shops, hotels and all these groups are funded by IRAN and SYRIA because the Koran condones it. 1. The labelling of the Jews ~ an inherently evil which defines what they say or describe characterizes the Jews or Israel in a negative way. 2. Creating a threat ~ that the Jews are an existential danger to all humanity! 4. And ~~~ by using their children for propaganda. Sadly they are victims too. From the very young they are brainwashed against Israel. In a forceful speech at Auschwitz-Birkenau marking International Holocaust Remembrance Day this year, Israeli Prime Minister Benjamin Netanyahu reasserted the right of the Jewish people to self-defence amid growing concern over the Iranian threat and increased attempts to de-legitimize Israel and hand-cuff its military. Today, God is raising up apostolic ministries, spiritual fathers, who by the Spirit are laying foundations for His house; churches where Jew and Gentile constitute “one new man,” being built together into a dwelling of God in the Spirit (Ephesians 2:13 – 22). God’s word to the church (in Israel and everywhere else) is to look back at what happened in the past ~ we are to learn from the examples of history, and we are to keep our eyes on the Messiah and what He is doing today. He’s doing a new thing on the earth and this is where our eyes are to be focussed (Isaiah 48: 6 and 43: 18 – 19). The Bible says that God, the Keeper of Israel neither slumbers nor sleeps ~ Psalm 121: 4.